A Rainbow Six Siege closed alpha is coming, and while Ubisoft hasn't yet announced a start date, it has released some details about what you'll need to do if you want to get in. The short version is this: Live in North America or Europe, speak English, have a Uplay account, and own a PC. Those specs, by the way, are strictly for the alpha according to Ubisoft. Rainbow Six Siege strikes me as kind of silly—busting into somebody's house and then turning it into a fortress and waiting for the cops to show up has to be the worst kidnapping plan ever—but setting that aspect of it aside, it looks like it could be a lot of fun. 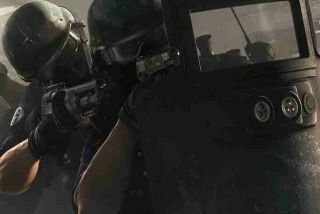 Evan Lahti wrote that his hands-on preview at E3 2014 "sold me on Siege's potential as a competitive multiplayer FPS," and predicted that it will attract a large audience among PC gamers. Details about the closed beta, including how long it will last, what content will be available, and when it will begin, will be announced at a later date.